The following is a list of upcoming meetings and conferences. 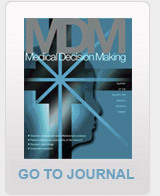 SMDM meetings provide a highly interactive forum for discussion of novel research based on decision and behavior theory and analytical models applied to health related decisions. Presentations or original research, keynote talks, special symposia and short courses offer attendees the opportunity to explore diverse topics in medical decision making.